We have a tap in the front garden with a concreted "bowl" beneath it. It came with the house, but it seems that the previous owners used it as a bird bath, so I have continued the tradition. Throughout the day, birds seem to take their turn at bathing. 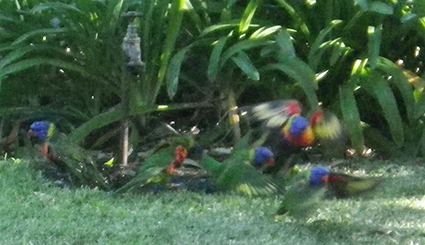 Around the 4 pm mark, the Rainbow Lorikeets have their turn. They have an all in, very noisy, very splashy bathing routine. It's like family groups come down for a swim! The Masked Plovers don't really bath. They splash water on themselves, drink, and preen. The cockatoos, corellas, and galahs seem to prefer a bird bath on a stand that is wider as well. It also came with the house and is out the back. Koels have also bathed in the larger sized bath. I like a bathtub that fits me. I like to sprawl out and soak. Relax my shoulder muscles as I sink into the depths. I'm not terribly fond of the tubs where your knees are under your armpits and you do a quick splash without the joy of soaking! So I completely understand the birds needs for a suitably sized bath! Do you like a good soak in the bath?